Sometimes, in life, you just hate being around something and you don't know why. That feeling of irrational fear also applies in the animal kingdom. Here are 32 animals with irrational fears. 1. 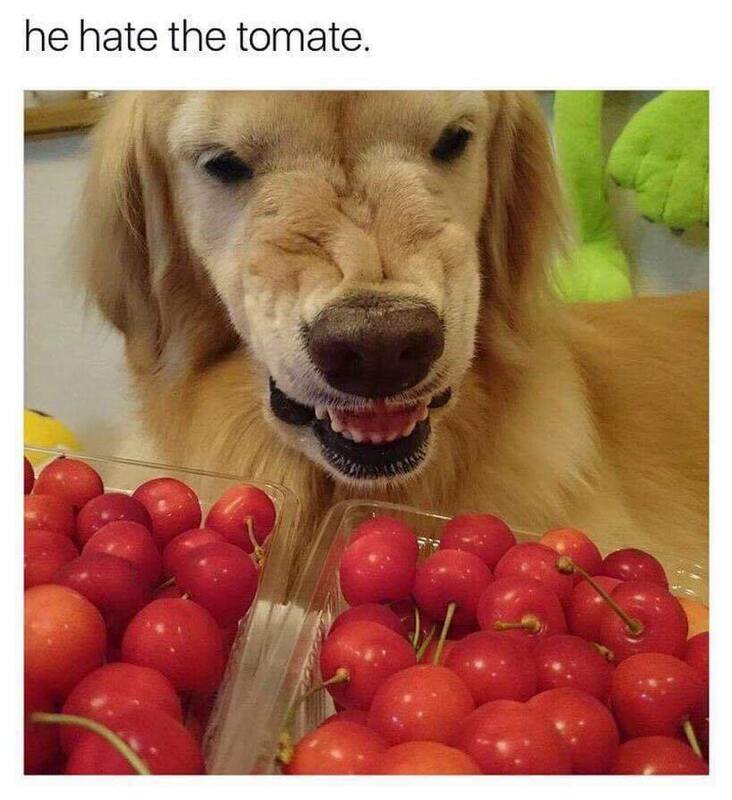 This dog is NOT here for tomatoes. 3. This puppy literally freezes in the snow. Get it? 4. Bath time? Hard pass. 5. This cat cannot stand horses. Or maybe just specifically this horse. 6. When you're scared of literally a smaller version of you. Wait? Is that not a thing? No. Just me? 7. When you're scared of current you. Much more relatable. 8. We've all been there on a rough morning. 9. This dog is like, "SKYNET IS LIVE." 10. If it helps, the fish is also not loving this situation. 11. Do NOT show this dog Toy Story. 13. He was okay with the balloon until it went bye bye. 14. Someone get this doggo a "do not pet" vest, STAT. 15. Fetch is not his game. 16. It's the most wonderful time of the year — unless there's a terrifying demon gift under the tree. 17. Or if there's a magic crystal ball of terror and snow is around. 18. In this dog's defense, turtles are basically like little dragons who carry their house around with them. 19. Crinkled paper = 1000 percent scarier than regular paper. 20. Also paper bags. Those are also scary forms of paper, apparently. 21. Sometimes cardboard can also be too much, like the cardboard tubes that hold Pringles. 22. He's as scared as most people would be of the real Godzilla. 23. Fear of thighs or fear or tail? Either way, why? 25. You've heard of commitment-phobia? How about air-kiss-phobia? 27. But the peels are even more terrifying. 28. And those green bananas (AKA cucumbers)? They're bonkers scary. 29. This is a ... bug? Scrap of paper? Something tiny and nonthreatening, for sure. 30. Don't share this post with Julia Roberts. 31. I iz scared of EVERYTHING. 32. Wait, no, this one is TOTALLY rational.